By calling personally at one of our offices during office hours. By asking us to call at your home where you often feel most comfortable. Usually a doctor or nurse is called. Once the doctor or nurse has been, please telephone us to arrange the removal to our Chapel of Rest. We provide experienced staff 24 hours a day to effect the removal within an hour of your call. A funeral director will contact you either that day or possibly the next morning to arrange a convenient time to sit down and discuss the funeral arrangements with you. You will normally be informed by the hospital. Please contact us to let us know as soon as possible. We will inform you of the best procedure. 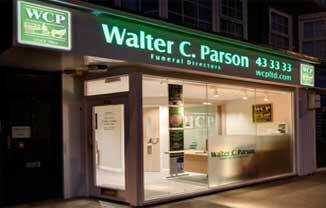 We will arrange a convenient time to sit down and discuss the funeral arrangements with you. We are only a phone call away to help you make some order of the disorder. Please feel free to contact us. We will be pleased to offer friendly, professional advice, without obligation. All deaths need to be registered at the local register office in the sub-district where the death occurred. We will advise you on all aspects of registration; Where to go; documents required, opening hours, appointments necessary etc. Sometimes it is possible to inform the registrar of a death by declaration: i.e. in a different registry office than the local one. This is particularly useful if you live in a different area to that where the death occurred. We will be happy to advise you of the procedure. Tell Us Once - The registrar will give you details of the Tell Us Once service, which reports the death to most government organisations in one go. Please click here to visit our Registration page which contains full contact details and opening hours of registry offices in the local area. Sometimes a death may have to be reported to H.M. Coroner. You will be kept informed by the coroner's officer - sometimes a policeman. In due course the coroner will issue a certificate of the cause of death for the registrar. Circumstances vary as to procedure but we will be able to explain this to you. We will liaise with the coroner and keep you informed in all cases.